Jelf Employee Benefits has identified that UK Google searches for the term ‘pensions freedoms’ (and three other variants with and without plurals) have increased by 913% during 2015. The employee benefits consultancy believes that pensions freedoms have really struck a chord with the UK public and certainly helped raise awareness of pensions as a whole. That doesn’t necessarily mean, however, better outcomes for everyone. Whilst the UK’s engagement with pensions seems to be on the rise, and tempting as it is for individuals to seek advice from a well-respected relative; mate in the pub; or even via search engines, Jelf Employee Benefits believes there is a real opportunity for employers to step up. Pensions freedom has engaged the intended audience of those about to retire, but also a secondary audience who are cashing in pensions because they can, with no intention of retiring. What we don’t know about this second cohort is what impact that action might have in the future on their ability to retire. Employers need to take a responsible approach to their employees’ financial education and longer-term retirement planning, to protect both the employees and the employer themselves. Lee Coles, head of retirement services, Jelf Employee Benefits said: “Pensions freedoms was a real hot topic during our employer-sponsored financial education courses last year too. We couldn’t be more pleased that the topic has caught the public’s imagination but of course, rather than simplifying retirement decisions, there are some complexities and longer-term consequences that need to be understood. “This is true of any big financial decisions made by employees throughout their career. If there is no help put in place for people to make better choices, employees may need to work longer than either they or their employers would ideally want, and that’s a problem for all concerned. It’s also important not to dismiss the physical impact financial stress can have. 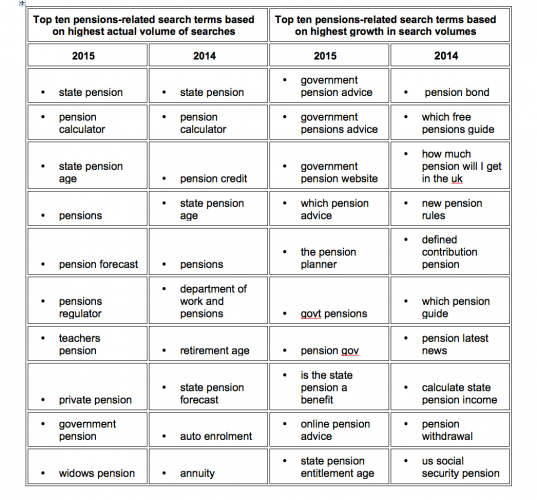 As well as identifying a significant increase (50%) in searches for the generic terms ‘pension’ and ‘pensions’ in 2015 vs. 2014, Jelf Employee Benefits also came across some interesting findings in the more detailed queries. (See table below). Coles said: “We predicted last year that as increasing numbers of people become better educated about their retirement savings via communications about auto-enrolment and pensions freedoms, that the types of searches they undertake would become ever-more sophisticated. However in the short term, it seems that as more people are aware, yet currently less well-informed, the searches were in fact less sophisticated than during 2014. Are apps increasing the take-up of voluntary benefits?